I started this knitting gig about six weeks ago. My Mom got me started, fixed my mistakes and helped finish her up. And so did Bev’s magic hands. I know how to bind off now. I have absolutely no idea how to cast on. Which is why I haven’t started on another project yet. Minor details though. It took me 1 week to mess up as much as I possible could. It took me 2 weeks to distinguish a knit from a purl. It took me 3 weeks to be able to undo my row to fix a mistake. It took me 4 weeks to complete 3 rows without a mistake. My favorite part is the fringe. I knew I wanted fringe on the scarf when I started it. And I love it. I just don’t love how static has these little guys floating through the air and taking my hair with it. Boo static, boo. For my next act, I will be doing a hat. A matching hat. 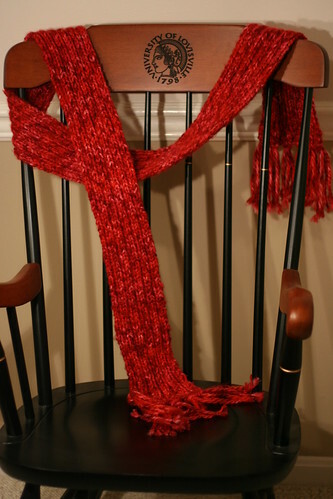 So it will be ribbed like my scarf. And in the same yarn. But I may have to omit fringe. Or just put a big tassel on top. We’ll play that one by ear. 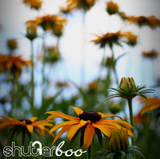 ~ by shutterboo on December 17, 2009. Fantastic scarf! I love the yarn you chose, it was so soft and smooshy. I may even have to get some and make a scarf for myself! Can’t wait to see the matching hat! Thank you, PodMate. You’ll probably be the first to see the hat. Just give me about 6 weeks. Great job. For those of us non-knitters, what is the difference between a knit and a purl? It’s how you do your loop with the needles. When you look at it, a knit is a “V” shape. A purl is a horizontal line (-). That’s how I understand it at least. 2. 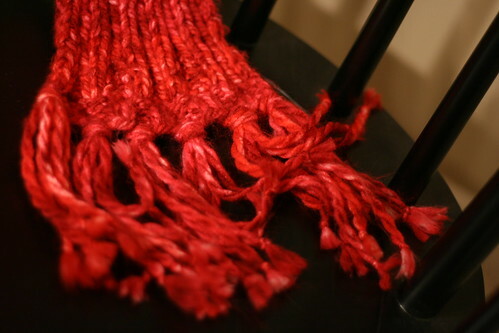 Static is more attracted to synthetic material, may try changing yarn if that is possible. 3. Buy some conductive shoes, while this won’t get rid of static in your scarf it will keep you from getting shocked and give me a reason to laugh at you. Boo Rev, boo. I was thinking more along the lines of static guard. Fantastic job! You go on and wear that scarf. 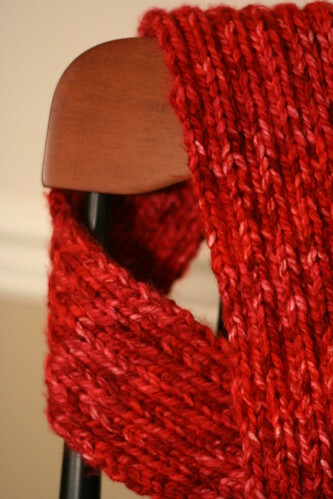 The difference between knit and purl is where you carry your working yarn. To do a knit stitch you are holding the yarn to the back of the work and you open your stitch from the front. To do a purl stitch you hold your yarn in front and you open the stitch from the back. You are correct in saying that a knit is a v, but if you do nothing but knit stitches, in every row, all of your stitches will look like horizontal bumps, but they won’t necessarily be purl stitches. Have I lost you yet? It would be soo much easier to explain in pictures! Awesome job! I tried knitting once, let’s just say I shouldn’t be allowed to toy with pointy objects. I would call dibbs on it, but it wouldn’t be fair to Pretty Scarf. Living in Houston it would be shown off once a year. If lucky. That looks great! I tried knitting a few years ago but I just couldn’t get the hang of it.